I took a break from shooting due to the cost of the ammo I was burning through. I also realized I was shooting for fun, but not really improving my skills. I decided to take my shooting in a different direction in the short term. My mom asked me to take her shooting, a woman I used to work for asked me to take her shooting, and a volunteer opportunity I signed up for resulted in me coaching new women shooters. All that seemed to point in one direction: learn to teach. I passed an NRA certified Pistol Instructor class on November 10th, 2013. 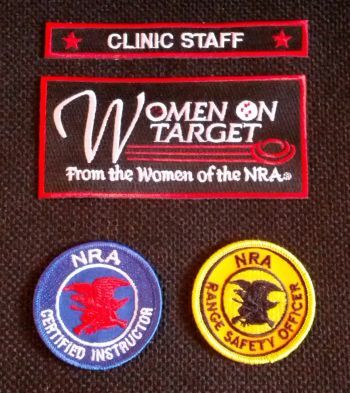 I passed an NRA Range Safety Officer course on Sunday February 2, 2014. I volunteered for a Women On Target® (WOT) event March 30, 2014 at the Sir Walter Gun Club. I worked the “pistol plinking” event where we taught women to shoot 9mm pistols and shoot steel targets. Do I feel I’m ready to go out and start a business teaching people to shoot? Heck no! But I do want to find volunteer opportunities to work with more seasoned instructors and build my skills. It’s really a thrill to see a group of ladies walk into a class room with some level of trepidation and/or anticipation at the beginning of a class then see them leave with a sense of real accomplishment ( and a target with bullet holes in it!) at the end of the day.